You can use the SharedSizeGroup attribute to share column sizes across different grids. You can’t normally share sizes of star-sized columns across multiple grids, however, since star sizing works only in the context of the current grid. Below is an example of how to get a star sized column to be the same size as a star sized column in a different grid. In the example, we have two grids. In the first, we have two auto-sized TextBlocks and then a star-sized TextBox that takes up the remaining space. In the second grid, we have just a TextBlock and a TextBox, but we want the TextBox to be the same size as the one in the first grid. Using SharedSizeGroup on the TextBox columns won’t work, since the columns would then get auto-sized. The solution is to set up a SharedSizeGroup on every column except for the TextBox columns and to add a dummy third column in the second grid. The TextBox columns will then each independently use star sizing and end up the same size. You can use autosizing for grid rows or columns to have the row or column automatically size to fit its contents. There are times, however, when you want the row or column to fit its contents, but only up to a limit. E.g. Autosize a row height, but only to a maximum of 20% of the size of the entire grid. You can autosize within limits by using the MaxHeight attribute and a value converter. Below, we have a grid with two rows, each containing a ListBox. The second row is set to autosize and the first to use all remaining space. The second ListBox will take as much room as it needs (grow to fit all elements), until it reaches 20% of the height of the parent grid. At that point, it will be constrained and get a vertical scrollbar. Here’s one more example of a custom panel. 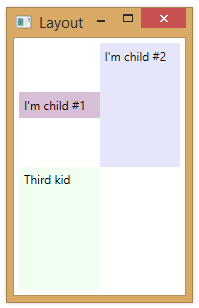 The code below is for a panel that arranges its children in a very simple treemap sort of structure. (This implementation isn’t really a treemap, but vaguely similar to what has been described in the literature). 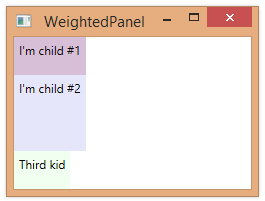 The panel defines a Weight attached property that the child elements use to indicate a relative weight. The panel then sorts the children based on weight and arranges them such their final area is proportional to their weight. // Allocate space for each child, one at a time. Below, we use the panel to create labels representing several states. The Weight property is used to record the states’ area. (The states are in no particular order). Note: One improvement that could be made to this algorithm is to adopt a true implementation of a treemap algorithm that includes “squarifying” elements to reduce the number of “long skinny” child objects. You can define an attached dependency property in a custom panel. The attached property can be used by child elements of the panel and in a way that affects how the child elements are laid out. In the example below, we define a boolean SecondColumn property. If set, this property indicates that a child element should appear in a second column. <Label Content="I'm child #1" loc:TwoColPanel.SecondColumn="True"
<Label Content="I'm child #2" loc:TwoColPanel.SecondColumn="False"
Below is another example of a custom panel. This panel arranges its children into two columns, flowing to the next row after both columns are filled. 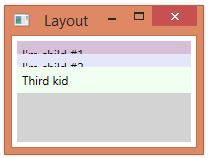 It also gives each child element a uniform amount of space, based on the total size of the containing panel. <Label Content="I'm child #1" VerticalAlignment="Center"
Below are some images showing the result, as we resize the panel. Note that the first label stays vertically aligned in the center of the area allotted for it, rather than stretching to fill the area like the other labels. 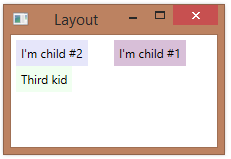 By default, a Panel control will respect its children elements’ Panel.ZIndex values when doing layout. 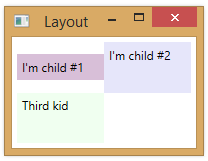 In the custom panel below, we overlap child elements during the arrange phase. 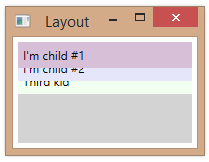 If we don’t specify ZIndex values, each child layers on top of the previous child. <Label Content="I'm child #1" Panel.ZIndex="3"
<Label Content="I'm child #2" Panel.ZIndex="2"